Traditionally, work flexibility has been the sole domain of HR. But, increasingly, I see Facilities teams in organizations, and the vendors that serve them, initiate the flexible work culture change process because transforming the workspace can be a great opportunity to rethink how, when and where work is done more broadly. Check out the insightful questions OfficeSpace Software asked when they interviewed me for this terrific article (below). Flex+Strategy Group CEO and Founder Cali Yost breaks down the importance of a strategic approach to flexible working. When you hear “work-life balance” do you just hear “work less?” What does it really mean to have a flexible workplace? Cali Yost, CEO and Founder of Flex+Strategy Group, has dedicated her career to helping organizations find success in flexible working. She knows the value of having a strategic plan in place and how important it is to be able to communicate that value to the C-Suite. How were you first introduced to flexible work cultures and why did you become interested in helping build them? 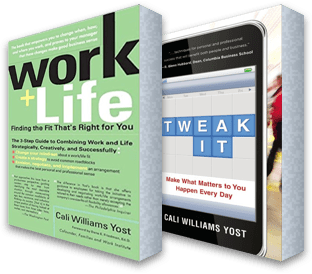 Cali: Believe it or not, I actually first became aware of the need for flexible work cultures in the early 1990s when I was the young, newly-minted manager of a bank. A number of bankers that worked with me, including a dad, were having trouble fitting work and life together. I saw that it was hurting my business and it just made sense to me that if I gave them a little flexibility, they would be able to deal with the challenges of having newborn children and still be able to remain productive and contribute to the work we had to do. I started exploring what that could look like and realized other people were starting to have these conversations as well. I decided to dive into this newly emerging recognition that there needed to be flexibility in how, when, and where work is done for business reasons. I have always come at this from a strategic business perspective because I could see from my front row seat as a manager that people who got flexibility were able to continue to contribute and they often contributed more. It was a win-win. The problem was I was only one lone junior manager in a much larger organization and realized that this needed to be a full organizational business strategy for managers like me and individuals who worked for managers like me. How do you think flexible work culture has evolved in recent years? Why do you think it has become such a prevalent way of working? Cali: It’s evolved from a policy and a perk that lived outside of the daily operating model of the business in HR. That’s where it still lives in a lot of organizations, it’s something you sort of sign up for like any kind of program or policy. It has to be an active, intentional, strategic way of getting work done. That’s going to depend on the changing realities of the business and its people. I’ll use workspace as an example because it really is one of the key drivers of this way of working. Leaders at organizations have figured out that if they put more people in the same amount of space, they’re going to save a lot of money. Yes, to a degree, you get more collaboration from that densification of space, but for a lot of people it’s tough on day-to-day productivity. What I’m seeing with my clients is a recognition that you need to expand the definition of workspace to onsite and off and give people the flexibility to determine where they’re going to work best based on what they’re trying to get done. You’re still able to retain all the benefits of growth within the same real estate footprint, but you’re allowing people the flexibility to utilize that space in a way that allows them to get their jobs done most effectively. What are some of the key elements to keep in mind for an organization that is in the process of introducing a flexible work culture or struggling to properly manage one? Cali: First and foremost, understand what a flexible work culture is and what it is not. It is an active, strategic way of working based on the ever-changing needs of the business and people. There also has to be coordination with the facilities group because in that flexible work culture, facilities is not limiting the onsite options for people, they’re encouraging people to consider the offsite workspaces they could be using as well. Facilities is taking a much more holistic role in helping people see the options for themselves. Then you have HR and it isn’t just about writing one-size-fits-all rules. They’re helping give a manger, for example, the skills to partner with people to make sure they know what’s expected of them and getting updates on where people are in terms of their performance on a regular basis. From that place of knowing that people are doing their job, you’re able to then give those people the freedom to be flexible in how, when, and where they’re doing that job. How do you think the physical workplace should be set up in order to better facilitate flexible workers? What strategies can be put in place to ensure everyone is still a cohesive team? Cali: I think workspaces should be developed around the general rule that, for the most part, most people like the ability to work remotely but also want to be in the office on most days. I’ve seen this play out over and over. When people are given complete freedom to choose how, where, and when they work best, they will generally choose to work remotely maybe one or two days a week. Maybe three, but the sweet spot is one or two days. Workspaces, both onsite and remote, should be developed around the particular type of work that a person would do. Let’s say you have a group that is graphic design heavy and they tend to be very desktop-driven. You have to make sure the graphics people in that department are able to have access to a desk that has the right equipment they need at all times, but also access to the software they need to work remotely as needed. You’ve used the term “work-life fit” as an alternative for “work-life balance.” Could you break down what that term means and why you prefer using it? Cali: I know when this happened because I was pregnant with my oldest daughter and she is now 20 years old. I was at a large multinational bank doing a flexible work strategy project and I was talking to an executive. I was very passionately describing all the benefits that he would get if he supported the work-life balance of his people. He stopped me and said “I’m going to be honest with you: every time you say ‘work-life balance,’ all I hear is work less.” I told him it’s not about working less, it’s about fitting work and life together in a way that allows people to bring their best to work but also to other parts of life. That “work-life fit” is different for everybody and it’s always changing. Your goal is to create flexibility that allows for all those different workplace realities to live together. I started using it over and over again and realized it was a basic, fundamental, powerful thing. Everyone has a work-life fit, that senior executive could talk to me about his work-life fit as well as all the other realities of people who worked for him. Nobody was right and nobody was wrong, so it suddenly removes the judgment of who’s doing it the right way. Work-life balance is just this big deficit model where you can never achieve “balance.” Work-life fit is a verb, it is not a noun. It is always changing and you are managing it which gives people a sense of power.